Bogotá, Colombia, Sep 7, 2017 / 11:22 am (CNA/EWTN News).- In a lengthy speech on Thursday, Pope Francis urged the bishops of Colombia to uphold their pastoral responsibilities, proclaiming and teaching the truth even in the face of challenges. 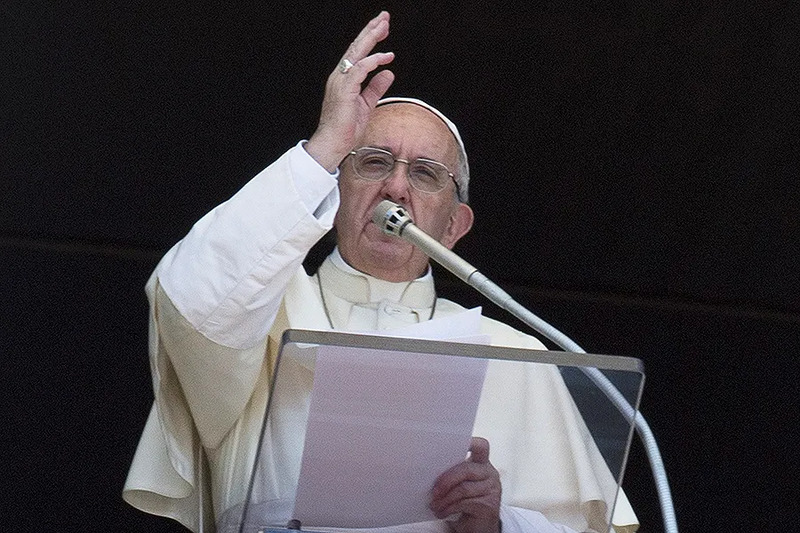 “From your lips as legitimate shepherds of Christ, Colombia has a right to be challenged by the truth of God, who never ceases to ask: ‘Where is your brother?’ That question may not be silenced…” the Pope said Sept. 7. “Christ is the word of reconciliation written on your hearts. You have the power to preach that word not only in pulpits, in ecclesial documents or newspaper articles, but also in the hearts of individual men and women,” he said. Pope Francis addressed the Colombian bishops in Bogota on the first full day of his Sept. 6-11 apostolic visit to the country. This approach is what will help to “unmask cold statistics, twisted calculations, blind strategies and falsified data,” he said. 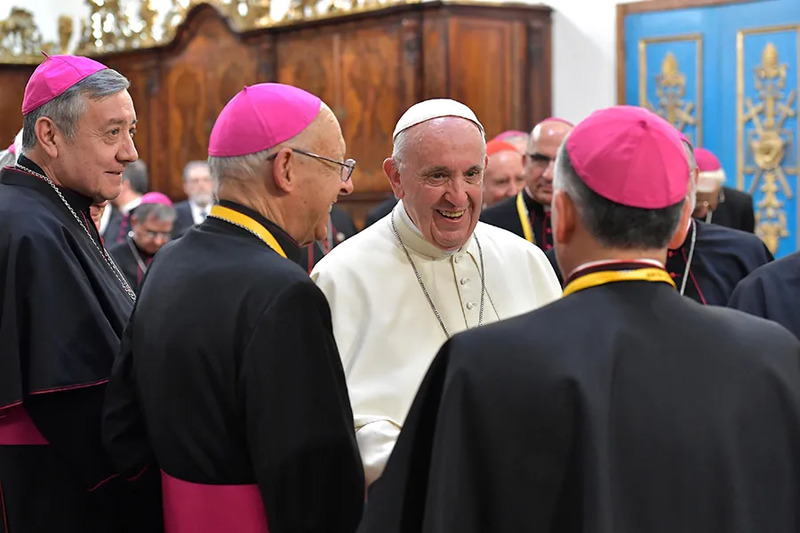 Acknowledging the generous pastoral work already carried out by the bishops, Francis then laid out his concerns for what he sees as challenges to the Church living out its mission. First among these are challenges to Colombia’s families. The defense of life from the womb to natural death, the “scourge of violence,” alcoholism, the weakening of the marriage bond and the absence of fathers are all attacks on the life of the family today, he said. 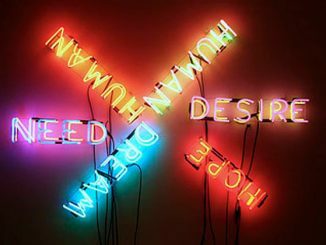 Young people are facing the threat of “spiritual emptiness,” which they seek to escape through drug use, frivolous lifestyles and a rebellious spirit. Lay faithful in general, even those who attend Mass and practice their faith, face “the new dogma of selfishness and the death of solidarity,” he noted. “I offer you no recipes, much less do I intend to leave you a list of things to do. Still, I would ask you, as you carry out in communion your demanding mission as the bishops of Colombia, to maintain your serenity,” he encouraged. When love grows weak we become impatient and anxious, making ourselves busy with many things as we are “hounded by the fear of failure,” he said. Instead, “believe above all in the smallness of God’s seeds. Trust in the power hidden in his yeast. Let your hearts be drawn to the great beauty that leads us to sell everything we have, in order to possess that divine treasure,” he urged. Speaking more about priests, who he said are on “the front lines” of the Church, the Pope said that the first gift a bishop can give his priests is to be a father to them – the physical and affective closeness of their bishop is a vital and urgent need. And although in this digital age it is easy to reach each other instantly, the paternal heart of a bishop should not be content with this impersonal and formal means of communication, but be truly concerned with where and how his priests are living. He warned them about silencing the voice of God or falling under the delusion that the success of the mission depends on their own “meagre virtues,” saying that prayer should be fundamental in the life of a bishop. He said they should also show particular sensitivity to the Afro-Colombian roots of the country, which have had a great influence on Colombia. “I am convinced that Colombia has one remarkable feature: it has never been a goal fully attained, a destiny completely achieved, or a treasure totally possessed,” he said. This treasure includes the nation’s human riches, vast natural resources, culture, heritage of the faith, and irrepressible joy and fidelity to the Gospel of Christ and his Church, he noted. This article should be re-titled: “Pope Approves and Supports Chilean Bishops’ Cover-Up”. So, what has been the result? Not one of them has gone to jail. Not one of them has been canonically sanctioned, removed as bishop, and laicized. Not one of them has been removed by Bergoglio. This is a scandal that Bergoglio knew about, refused to acknowledge, tried with every means at his disposal to suppress, and now covers it up and pretends is over. It cries out to heaven for vengeance.